turning black. Cut the top of brinjal and same way make a cross slit vertically till half. Dry roast besan in a pan. Let it cool. into the slit softly otherwise it will break. 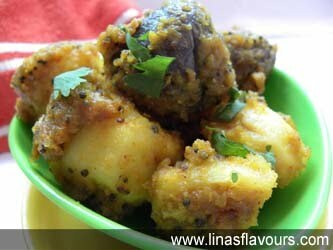 Prepare all the potatoes and brinjal like this. Steam boil it or cook it in the microwave. cook it on a low flame for 4-5 minutes. Garnish it with coriander and serve it with roti or paratha. Note: You can even temper it and then steam boil or cook it in the microwave.